The 2-Module Chassis features a backplane that enables sharing of Ethernet data between two installed iConverter modules that are equipped with Ethernet backplane ports. This enables the chassis to support a variety of networking configurations. Installing an iConverter copper-to-fiber module and a four-port switch module provides a fiber uplink and five 10/100 or 10/100/1000 user ports. Equipped with an iConverter management module or Network Interface Device (NID), the 2-Module Chassis provides a secure, local or remote managed solution capable of supporting advanced Ethernet services for Enterprise and Service Provider networks. It can be remotely managed via IP-based SNMP or Telnet. The 2-Module Chassis is ideal for extending a fiber network connection across a campus. 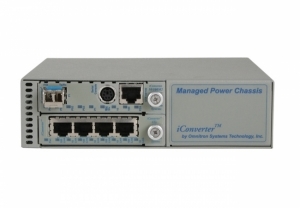 The 2-Module Chassis provides a carrier-grade solution; combining a compact, managed edge switch. Installing an iConverter NID plug-in module and a four-port switch module provides a securely managed Carrier Ethernet demarcation for one or more User-to-Network Interfaces (UNI). This configuration provides an MEF certified deployment supporting advanced Operation, Administration and Maintenance (OAM) features. 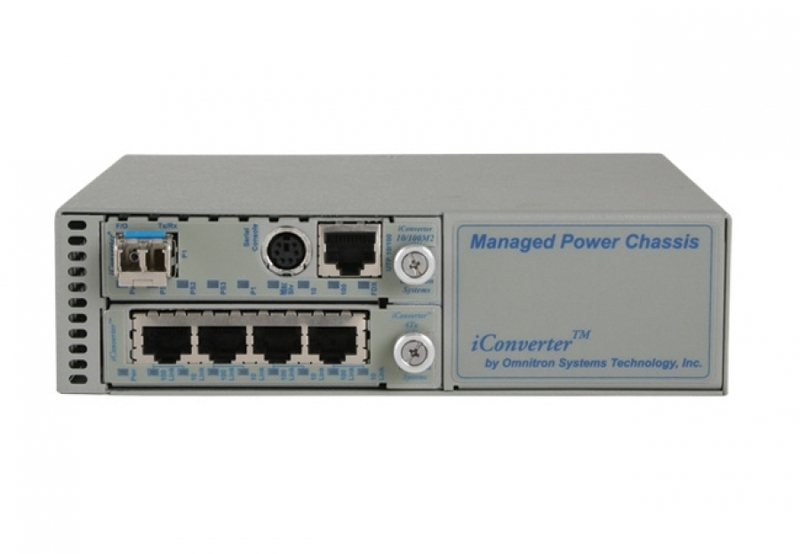 In this application, media converter modules are installed in a managed iConverter 19-Module Chassis for high-density fiber distribution from UTP switch equipment. At the Customer Premises, an iConverter NID module and a four-port switch module are installed in a 2-Module Chassis. A fiber link between the Central Office and the Customer Premise provides a securely managed demarcation solution supporting advanced OAM fault detection and performance monitoring. W: 6.7" x D: 5.51" x H: 1.87"
*Required for iConverter XG+ models. Register at www.omnitron-systems.com to download the iConverter XG+ Usage Guide. * Required for iConverter XG+ models. Visit at www.omnitron-systems.com to download the iConverter XG+ Usage Guide. High Airflow fans are always turned on.